Kareen Schnabel is originally from Germany but has studied and worked in Canada, the Bahamas and New Zealand after leaving Germany in 1997. 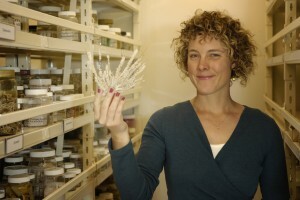 She completed her PhD in Marine Sciences at Otago University and has been the Collection Manager of the NIWA Invertebrate Collection since 2006. The Invertebrate Collection primarily houses deep-sea invertebrates from around the southwest Pacific and the Ross Sea and Kareen has been overseeing the sampling and processing of specimens on various NIWA biodiversity voyages as part of her duties. Outside the collection, her research interest is in the taxonomy, phylogeny and phylogeography of decapod crustaceans (crabs and lobsters) with special focus on squat lobsters, a small group of lobster-shaped false crabs that are found from the tropics to the sub-Antarctic areas and from the shallow waters to the black smokers of the deep. I am going to oversee the sampling and recording of the invertebrates we collect around the Three Kings Islands. I know the area is particularly diverse in some animal groups such as sponges, sea squirts and bryozoans (lace corals) with a number of species recorded as endemic for these islands. Sample numbers are notoriously low and some have been collected a very long time ago (e.g. by the Terra Nova expedition in 1911 that sampled in the area between 20 and 549m depth). I have been working on New Zealand invertebrates for more than eight years now and by managing the NIWA Invertebrate Collection I have learnt to at least roughly identify animals across a wide spectrum of groups, from sponges to corals, crustaceans, urchins and lamp shells. Combined, I have also spent more than six months on research vessels in New Zealand and Antarctic waters, collecting, recording and preserving biological samples for subsequent scientific study. Outside of New Zealand, I have participated in dive surveys on the Great Barrier Reef, the Bahamas and the Canadian Arctic. I hope that this experience will provide me with all the skills needed to identify and collect a broad range of samples that will provide us with a good representation of the Three Kings invertebrate fauna and in turn provide a baseline for future studies. I am based at the Greta Point campus of NIWA Wellington where I lead a small team that looks after the NIWA Invertebrate Collection. I often compare the collection to a library, just replace the books with sample jars; the processes of ordering, loaning and maintaining the items is very similar. We respond to a steady stream of requests for specific samples from all around the world, host visitors to examine their favourite specimens on site and we accession and identify new samples that are added to the collection through the extensive deep-sea sampling programs we are associated with. For a relatively small proportion of my time, I work on a microscope and progress my book on the records and description of New Zealand squat lobsters, I have another 30 or so species to illustrate, describe and name and which will probably take me a few more years to do.